1st. That my executor hereinafter to be named shall provide for my body a decent burial suitable to the wishes of my family and friends and erect over my grave a tombstone suitable to the wishes of my family and friends and pay all my funeral expenses together with my just debts and out of the money that may come into his hands as a part and parcel of my estate. 2nd. I give and bequeath to my beloved son W. W. Dunn all of my cattle and sheep of every description, all of my silver tea and table spoons, my book case and my horse, to have and to hold to him absolutely and forever. 3rd. I give and bequeath to my beloved daughter Susan C. Nicol one bed. 4th. I give and bequeath to my beloved daughter Theresa F. Chadwick one bed. 5th. I give and bequeath to my beloved granddaughter Gertrude Bagby one pair of brass andirons and one pair of shovel and tongs the same I loaned to my beloved daughter Mrs. M. H. Bagby. 6th. I give and bequeath to my beloved granddaughter Martha A. Hardy my buggy. 7th. 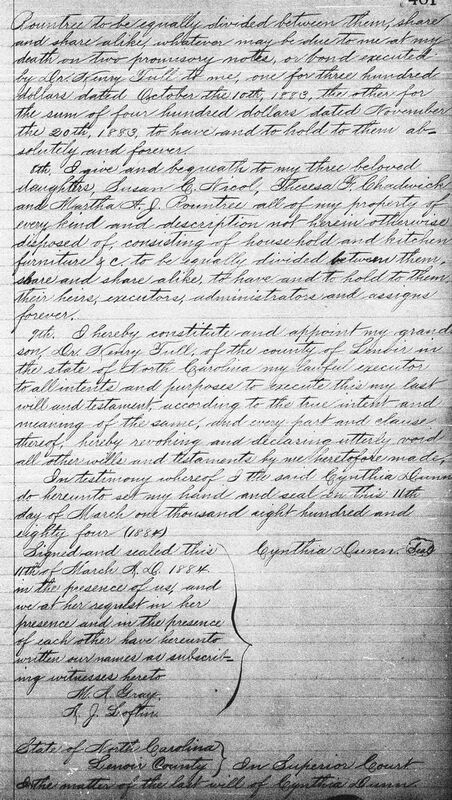 I give and bequeath to my three beloved daughters, Susan C. Nichol, Theresa F. Chadwick and Martha A. J. Rountree to be equally divided between them share and share alike, whatever may be due to me at my death on two promissory notes, or bond executed by Dr. Henry Tull to me, one for three hundred dollars dated October the 10th, 1883, the other for the sum of four hundred dollars dated November the 20th, 1883, to have and to hold to them absolutely and forever. 8th. 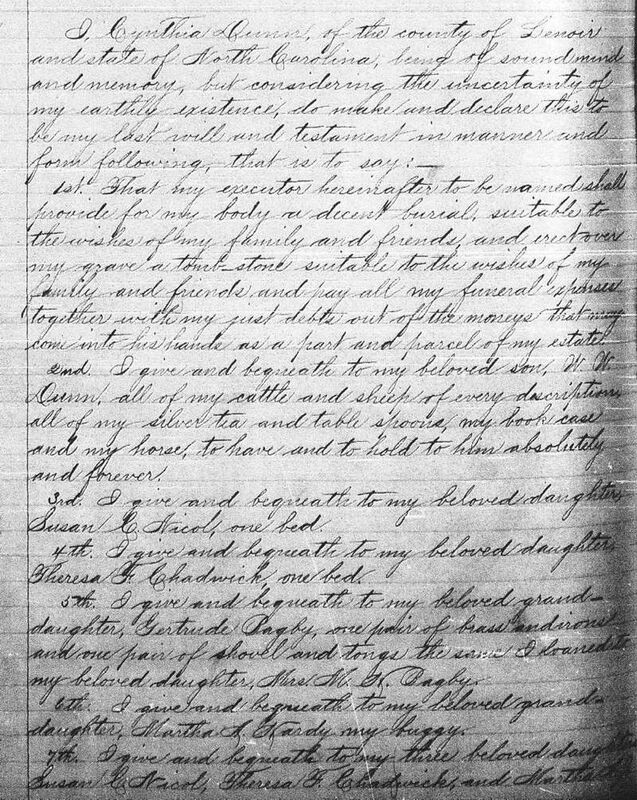 I give and bequeath to my three beloved daughters, Susan C. Nicol, Theresa F. Chadwick and Martha A. J. Rountree all of my property of every kind and description not herein otherwise disposed of consisting of household and kitchen furniture &c to be equally divided between them share and share alike, to have and to hold to them, their heirs, executors, administrators and assigns forever. 9th. I hereby constitute and appoint my grandson, Dr. Henry Tull, of the county of Lenoir in the state of North Carolina my lawful executor to all intents and purposes to execute this my last will and testament according to the true intent and meaning of the same and every part and clause thereof hereby revoking and declaring utterly void all other wills and testaments by me heretofore made. In testimony whereof I the said Cynthia Dunn do hereunto set my hand and seal on this 11th day of March one thousand eight hundred and eighty four (1884). Signed sealed this 11th of March AD 1884 in the presence of us and we at her request in her presence and in the presence of each other have hereunto written our names as subscribing witnesses hereto. In the matter of the last will and testament of Cynthia Dunn. It appearing to the court by the oath and examination of M. A. Gray and A. J. Loftin the subscribing witnesses thereto that the paper writing propounded by the executor therein named is the last will and testament of Cynthia Dunn and that the same was duly executed by said Cynthia Dunn in the presence of said witnesses and that at the time of signing the same the said Cynthia Dunn was of sound mind. It is thereupon adjudged that the said paper writing be admitted to probate as the last will and testament of the said Cynthia Dunn and the executor therein named qualify as such. This the 7th day of February 1887. 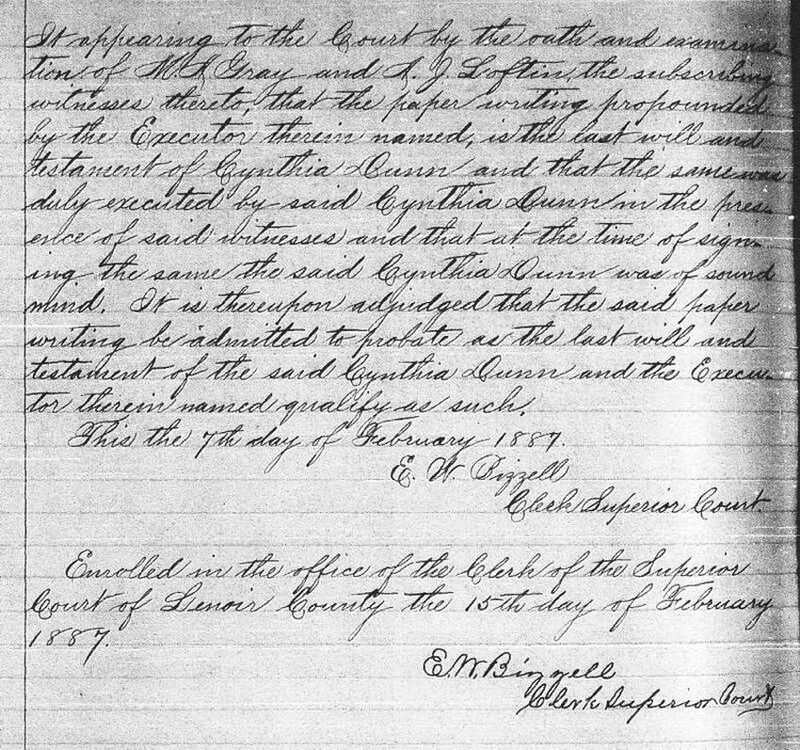 Enrolled in the office of the Clerk of the Superior Court of Lenoir County the 15th day of February, 1887.